If you have pain on the outside of your elbow and are involved in activities that require repeated use of your forearm (such as typing, painting, knitting, hammering or playing tennis) and have trouble with gripping objects you may have tennis elbow. Tennis elbow refers to overuse of your wrist, hand or forearm that can cause damage or tightness to the forearm tendons. Due to the tightness or damage of these forearm muscles or tendon pain can be caused at the point in which they attach to the arm, just on the outside of the elbow. The damage or tightness of these muscles or tendons can also sensitise neural structures in the area and give you a feeling of pain and/or weakness when gripping objects. Tennis elbow occurs because the muscles of the forearm are not accustomed to the extra load that they are under. This extra load can be from overuse, change of equipment, poor technique, altered biomechanics or insufficient forearm muscle strength. Cervical (neck) injuries or tightness can also contribute. The physiotherapist will complete a thorough examination to make sure the pain is due to tennis elbow and is not being referred from the shoulder or neck. Once the physiotherapist has established true tennis elbow pain there is a range of techniques that they may employ to assist in treating your condition. These could include soft tissue massage, electrotherapy, dry needling, neurodynamics (nerve stretching or movements), taping or a brace to help offload the area of muscle attachment and the development of a stretching and strengthening program. The physiotherapist may also assess your technique with certain activities and suggest more optimal techniques to help offload the injured muscle. If sport is contributing to your elbow pain then relative rest may be required before full return to sport. This may mean that you have to reduce the hours in which you are competing/training for your sport. The physiotherapist may also offer recommendations in change of equipment or technique if they believe it is contributing to your condition. Full return to sport is possible with a thorough rehabilitation process. 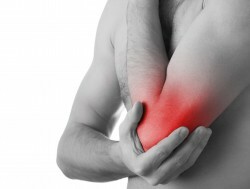 Reduction of your tennis elbow pain can be seen within several weeks with the assistance of physiotherapy treatment. If treatment is not sought tennis elbow pain can become a more chronic condition, with implications on your ability to work and play sport effectively.